Noelles surgery went really well. She did great and was declared the model patient of the day (she was the only one who woke up not screaming). 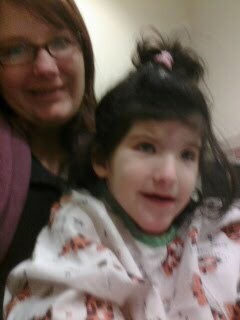 All dressed in our cute hospital gown. I wish I looked so cute. 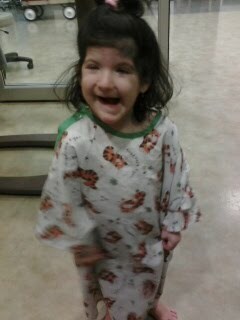 This is after the relaxer they gave her, she was crazy loopy, it was to funny. Post surgery she drank 16 oz of water right off and then just hugged her cup. At home swinging and eating a snack. She has had so much water and juice its great. While she was eating oatmeal she would take a bit and cry while she swallowed so I gave her some Lortab, she is lots better now. Thank the Lord for medicine. Thank you all my dear friends for all your prays and support. I know its been way to long since I have posted but I am hoping I will post more often, we will see. Tonight we are getting ready for surgery number 3. Noelle is having Myringotomy with Tube placement and Adenoidectony in short tubes placed in her ears and her Adenoid removed. 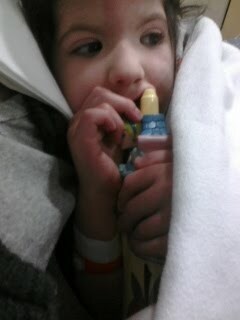 This is her second Tube placement. She has had a rough last few months and I am looking forward to having my sweet clean nosed little girl back that loves to laugh and play. I am excited to see if this helps little Noelle in the whole snoring department. The whole thing will take 20 mins and she will be completely out for the whole thing which is scary for me. I dont like it when she is under and she is a bear when she comes out of it. I will let you know how it all goes tomorrow. Im going to go to sleep its an early morning. 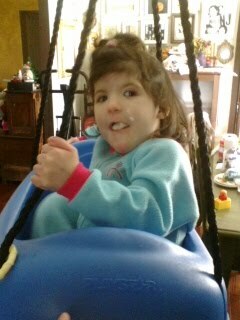 well folks Noelle is the most amazing little girl, nothing not even a scary long named syndrome can hold her back. She is talking!!!! yes she is saying WORDS!!!! Yes even whole sentences!!!!! She has said "I want one." "Who's that?" 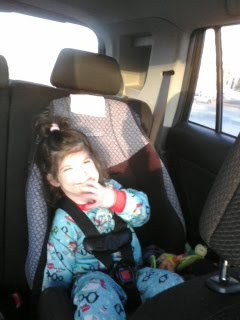 "Want more" "Need that" "Mama dirty" (her diaper was dirty) "Want that"
I love hearing her say things! It is so wonderful. In other news she is getting glasses today. She is near sighted, Im hoping this will help some with her walking. (she stumbles alot and does not see steps) I will post pictures when we get them. well thats all the exciting news for now. Who said that RTS would hold her back? 4 Cyann awakes crying (I wake Jon to go check on her) she was dreaming, he comforts her for a few minutes and gives her another blanket he comes back to bed and tells me what was wrong. Some nights are better than this but most are like this. I would also like to note that I dont go to bed normally before 11. What being a Mommy of 4 is like. Jon's alarm went off at 6:30, He did not get up. Zoey came in at 7 and told me she did not pee pee in her bed (YEAH!!!!!) I sent her back to bed. I get up and read my bible and get dressed and ready for the day. 11:30 Quite room time (Cyann and Noelle play in there beds and Zoey plays in her room), during this time I am paying bills, moving laundry, folding laundry, and picking up the house. 2:00 Nap time (I do my best to get all the girls to nap at the same time) but Tenley sleep longer than normal so she is still awake.